Treat your family to an unforgettable getaway on the shores of Lago Llanquihue. Thanks to this charming three-bedroom condo, your family will enjoy a comfortable stay with modern conveniences, lake and mountain views, and a great location. Plus, it's dog-friendly! Upon arriving at this vacation rental, you'll notice the welcoming atmosphere. Relax in the living room with a good book, or while you use the free WiFi. If you'd like to cook at home, you'll find everything you need in the well-appointed kitchen, including an espresso maker. The building includes a variety of shared services like a gym, a BBQ area, and a laundry room; all of them are available for a small extra fee. The family dogs are also welcome to join you at this home. This apartment sits just a few minutes away from shore of Lago Llanquihue, making it perfect for vacationers who hope to spend a lot of time enjoying the sun and the water. There are also several restaurants just down the road, so you don't have to go far to get a taste of local flavor, and the heart of Puerto Varas is about one-and-a-half miles away. If you're looking for more adventurous pursuits, you're in the right place: Puerto Varas is surrounded by volcanoes, national parks, and nature preserves. 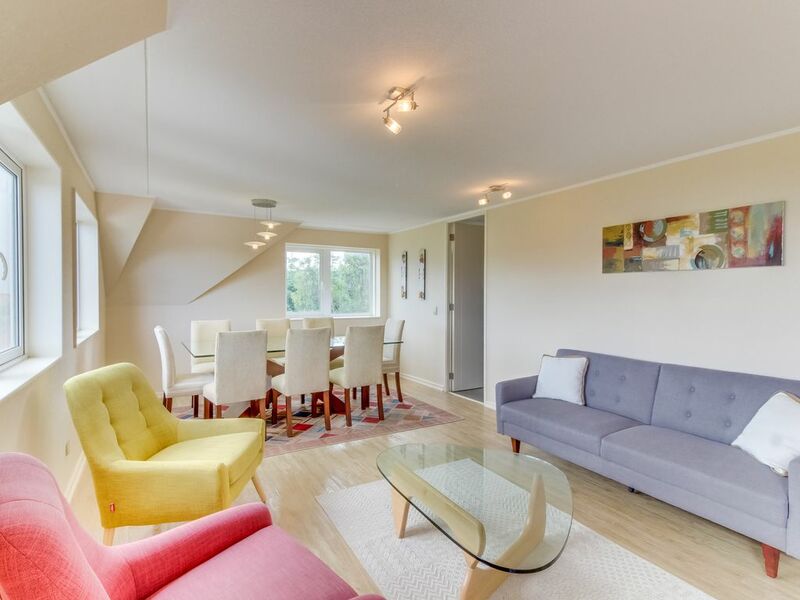 Whether you're here for a week-long getaway or a long weekend, you'll love every minute you spend at this modern Puerto Varas vacation rental. Reserve today! The washing machine is shared. Excellent apartment, very well equipped, very comfortable, all we need for a short and pleasant stay. The only thing we missed was some information on how to manage the oven... but compared with all the positive aspects, this is just a recommendation for the future. Thank you very much. Instalaciones en muy buen estado, cordialidad y resolución de algún problema por parte del encargado.